Chilled water air conditioning systems are commonly used in applications that need large cooling capacity such as hypermarket, industrial process and commercial air conditioning such as offices and factories. More and more homes are using this system to air conditioned their entire house because of its cost-effectiveness and no hazard of having refrigerant piped all over the house. Water is non-corrosive, has specific heat value, fluid, non-toxic and is cheap. This makes it an excellent choice compared to other secondary refrigerants such as sodium chloride brines, propylene glycols, ethylene, methanol or glycerin. The chiller is the section of the system where an exchange of heat occurred between the water that goes to the building and the evaporator. The water leaves the chilled water evaporator at 45°F or 7°C. This chilled-water is then circulated through the entire building by the use of a pump. In compression chiller, compressors are used to compress the refrigerant vapor in the condenser where it becomes liquid. In water-cooled condenser, the heat of the refrigerant liquid is rejected to the water using the shell and tube, shell and coil or double tube heat exchanger. The heated water is then piped to the cooling tower where it is cooled by rejecting the heat to the atmosphere. The cooling tower is usually located on top of the building. In most chiller applications, a water-cooled condenser uses a cooling tower to reduce the temperature of the condenser. In this case, the water loop system is separated from the chilled water that goes to the building. The water that has been cooled by the evaporated water at the cooling tower will enter the condenser at 85°F or 29°C. 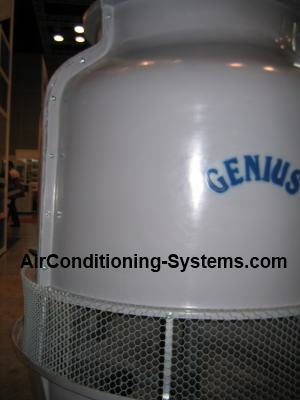 It picks up the heat from the condenser and leaves at 95°F or 35°C, an increase of 10°F or 6°C. The water is then sent to the cooling tower by the use of a pump to be cooled by evaporation of the water in the cooling tower. The cooled water temperature now drops to 85°F or 29°C and enters the condenser again. This process is repeated. Water is constantly added to the cooling tower by the use of water piping to replace those that has been evaporated into the air. The chilled water is piped into fan coil units which consist of fins & fans with large surface area that absorbed heat from the space through the air-heat exchange process. Each fan coil unit has its own thermostat that regulate the amount of cooling needed. The chilled water got heated up and returns to the chiller at about 55°F or 13°C. The water temperature would has been heated up by 10°F or 6°C after cooling the space. The water is then pumped back to the chiller evaporator where it is cooled back to 45°F before being circulated back to all the fan coil units. This process is repeated. See in greater details the operation and principles of a cooling tower.